Today is the third day of year 2012. The Mayans may have predicted the end of the world this year, but for me, it is definitely a new beginning, a new journey and another quest to share my thoughts with friends and foes alike. As I sit in the balcony of my house chilling (literally) in the winter winds admiring the lush green mustards fields in front I suddenly feel hungry which is nothing unusual for me, with the wintery feel , the mist and the cold – the cuisine that engulfs my senses is Tibetan! A piping hot Thukpa laced with some super hot dried chilli flakes would be the perfect catalyst to tingle my senses as well as filling up my pot belly that gargles in hunger. And in my house of course, any desire for food is never left unanswered. My home aside, one place where I love venturing into to satiate my craving for authentic Tibetan food is of course Majnu ka Tilla – Tibetan refugee colony. Though Majnu ka Tilla also has a fantastic Sikh history and promises a lovely Langar at the gurudwara, my senses simply dictate me to step into that small Tibetan galli(ally) and enter the portals of a world that only a select few in Delhi would relate to. It is said that few hundred years back, there was a person who would be engrossed in meditation for days together in this area. He had become weak, but would not stop meditating. People around the region started believing that he had lost his mind and started associating him with the legendary majnu. One of the gurus of the Sikh faith visited this place and was touched by this person’s devotion and blessed him and said that he would be remembered by posterity. Later when the gurudwara was built in this location, it became popular as Gurudwara Majnu ka Tilla. But today, Majnu Ka Tilla also has become synonymous to the Tibetan refugee colony and its culture around it. With the University of Delhi in its vicinity, MKT as the students like to refer to it as, has become a gastronomy hub for students from various parts of the country, especially India’s North East and of course the Tibetan community. 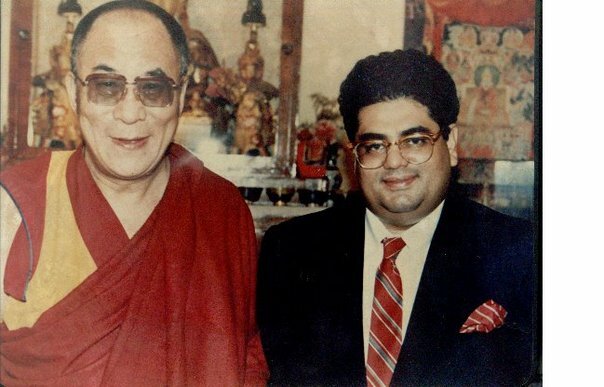 I go really far back with Tibet. How do I even start penning down my thoughts here? Way back in college (Government College, Chandigarh), we seniors decided to question these two young freshers – Tsering Tashi and Gyari Kalsang as a part of the very traditional ritual called ragging. Apart from the usual questioning and mischief, the foodie that I always was, I asked them about Tibetan food. They gave me the first insight about traditional Tibetan food. Needless to say, they were (perhaps) compelled (morally?) to invite me to their house for an authentic Tibetan meal. Let me remind everyone, that momos had not become omnipresent in India as yet. Though I had eaten enough of momos during my journeys to the north Indian hill states, I had never tasted a shabalay before. That snack at Gyari and Tsering’s place blew my mind! Today Gyari is a member of the Tibetan Parliament in India and Tsering is closely associated with His Holiness the Dalai Lama. The Human Trail: When humans started inhabiting Tibet, it was already a highly isolated land surrounded by forests and snow-mountains. Gradually some people became chiefs and started leading their tribes. About 2000 years ago, these tribes came together and formed their kingdom with Nya-Tri-Tsenpo as the first king to be succeeded by forty generations of kings. During the reigns of the first twenty-seven, the religion called Bon flourished in the country. However, it was during the reign of the twenty-eighth king Lha-Tho-Ri-Nyen-Tsen, that a volume of Lord Buddha’s teachings fell into his hands and Buddhism was initiated to this land. During the thirty-seventh king, Thi-Song-Deu-Tsen, Indian pundits and Tibetan scholars who knew Sanskrit were invited to translate the teachings of Lord Buddha. That was around 790 CE and the Samye Monastery was established and the first seven monks were ordained in Tibet. 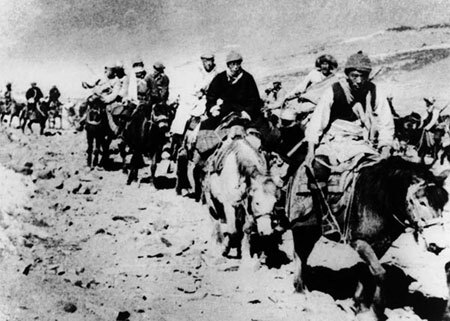 In 1949-50 in the Battle of Chamdo, China finally occupied Tibet. Between1950-59, several sporadic rebellions had taken place against the Chinese invasion. However the Lhasa Uprising of 1959 infuriated the Chinese and they started massive military crackdown of rebellions. In 1959, the fourteenth Dalai Lama Tenzin Gyatso along with a few thousand Tibetans had to abandon the Potala Palace – the official residence of the Dalai Lama and flee Tibet. They entered India after a tumultuous journey and were given refuge by the then Prime Minsiter Pandit Jawaharlal Nehru. 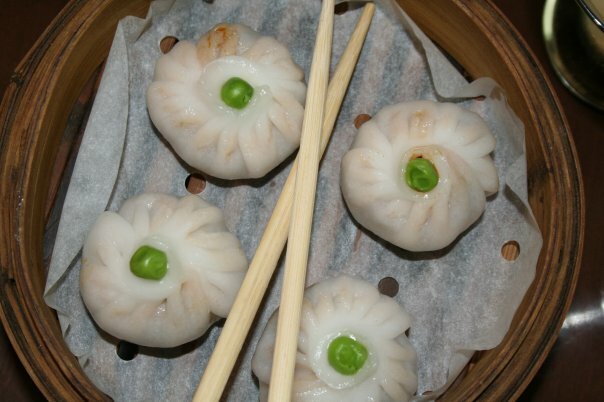 However, I have to tell you about another facet of Tibet – its lovely food. 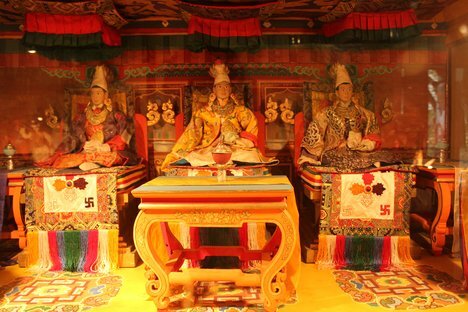 Traditionally, Tibet was divided into three regions – Amdo, U-Tsang and Kham. Amdo is the region from where His Holiness comes from. Amdo is known for its traditional cuisine. 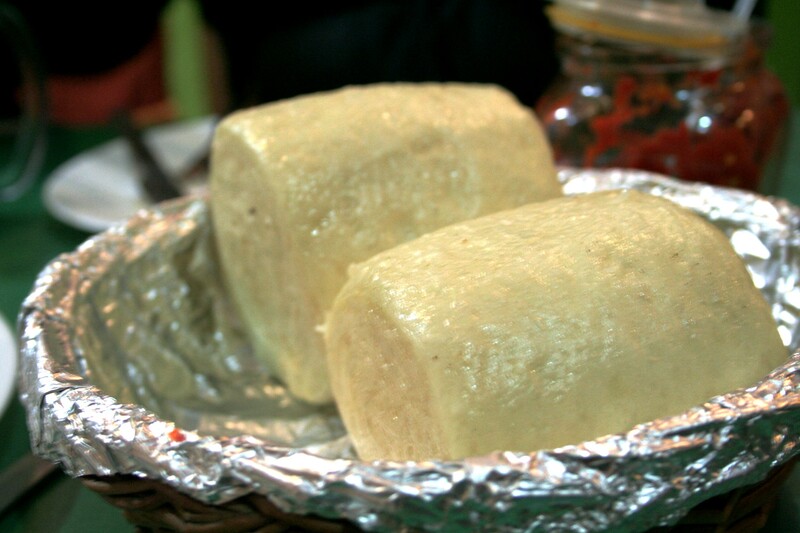 One of the dishes from Amdo which has become a favourtie dish of many Tibetans is thenthuk. This soupy pasta dish is uncomplicated – chunks of meat and diced vegetables chucked in to the stock along with wanton shaped noodles. However, my first love – shabalay is simply sinful. 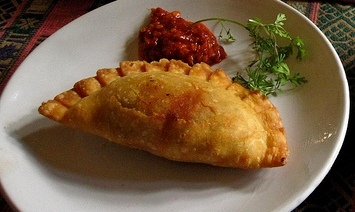 They are like meat samosas or patties. But the juice of the beef or meat that makes the filling also reminds me of a shepherd’s pie – only thinner in consistency, and the meat inside drier than a pie. In Delhi I have tried my shabalays everywhere possible – restaurants in Ladakh Boudh Vihar (Tibetan Monastery Market), Lajpat Nagar, Humayunpur, but eventually my heart and taste buds clicked on to this not so old restaurant in Majnu Ka Tilla called the Big Apple. Their shabalays are succulent and just of the right consistency. There are two versions of this dish – one is deep fried and another one is pan fried. Both renditions are of my liking and I shall refrain from picking favourites here. 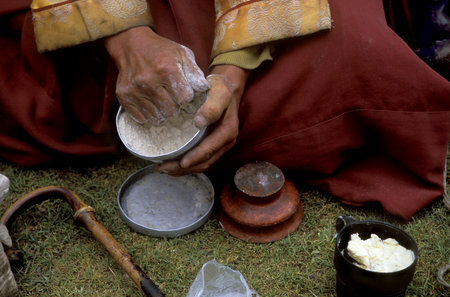 Another dish that I simply love is called tingmo – fermented Tibetan bread. 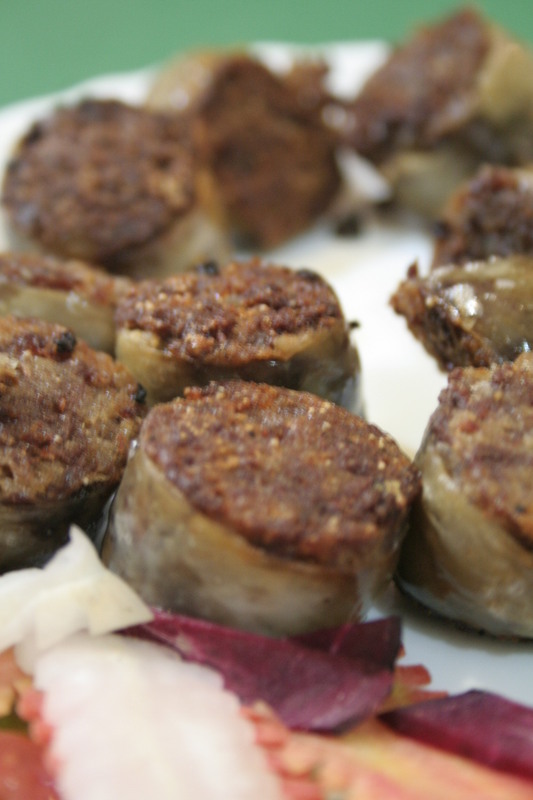 I combine it with shapta– a traditional beef dish sauted with spices. A perfect meal. I gave a brief history about Tibet before getting down to food in order to understand the requirement of that region, availability of ingredients and above all the spiritual philosophy of its people. 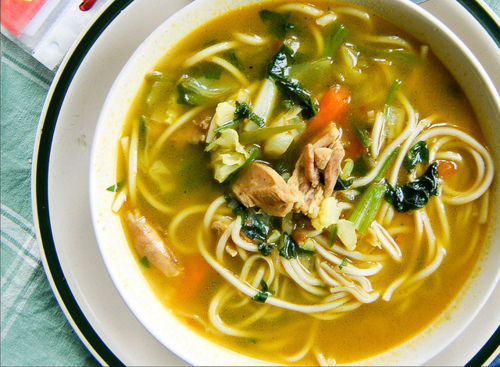 Tibet being a cold mountainous region, it is natural that its cuisine would have lot of ingredients from yak – be it yak milk, yak cheese or yak meat. To preserve beef and mutton, the protein is sliced into thin strips and air dried. The cold climate kills all the bacteria in the process and hence the meat can be consumed straightaway. Green vegetables are scarce in the hilly regions; hence you will see very less variety of greens used in a traditional Tibetan dish. Though, some of neat and simple Tibetan dishes can have tinge of greens like bok choi (pak choi) here and there. This however, brings me to the carbohydrate requirement of the people. 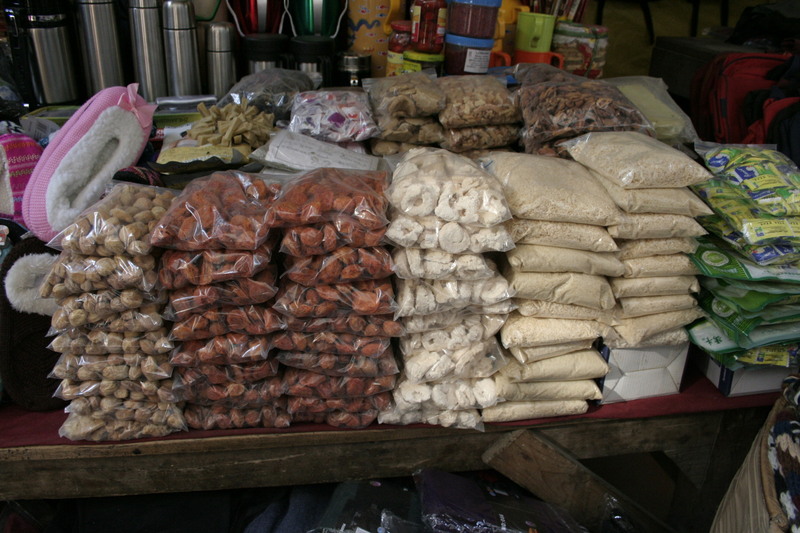 Tsampa – a dish prepared from roasted barley flour (Pretty much like the Assamese pithagudi or xandohgudi except for the key ingredient – rice) fulfills this gap. It is simple to prepare tsampa and is consumed usually with salty butter tea or milk. However, as simple as it may be to prepare, the consumption has a peculiar style; some of the roasted flour is put in a bowl with butter tea. The concoction is then mixed by rotating the bowl with the left hand and mixing the contents with right. Finally roll the mixture into small lumps and squeeze them into your mouth with your finger. There you are consuming Tibet’s staple diet. 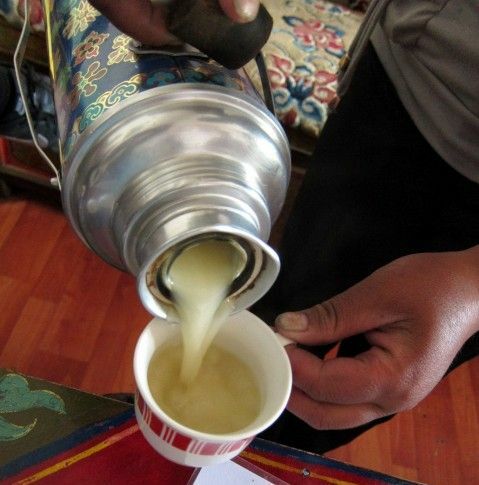 Butter Tea and the Great Butter Festival: Tibetan people are very fond of their butter tea or po cha. This salty tea is consumed several times a day because it not only heats them up but also energizes people to move about in the hilly terrain. 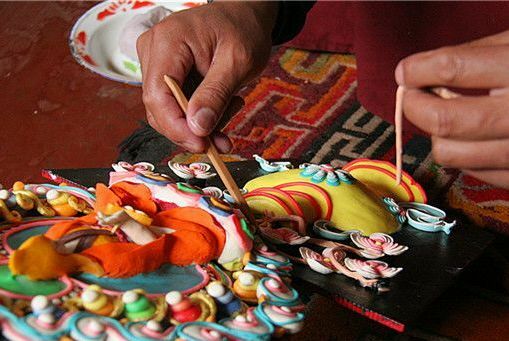 The Great Butter Festival is actually a Butter Lamp Festival where the entire city of Lhasa would be full of butter lamps and butter sculptures like flowers, figurines, birds and animals. It is celebrated on the fifteenth day of the first lunar month according to the Tibetan calendar. It is believed that the Great Butter Festival of Tibet started in 1409 when the founder of the Gellugpa Sect instituted the Great Prayer festival in Lhasa. This great Prayer Festival is known as Monlam. 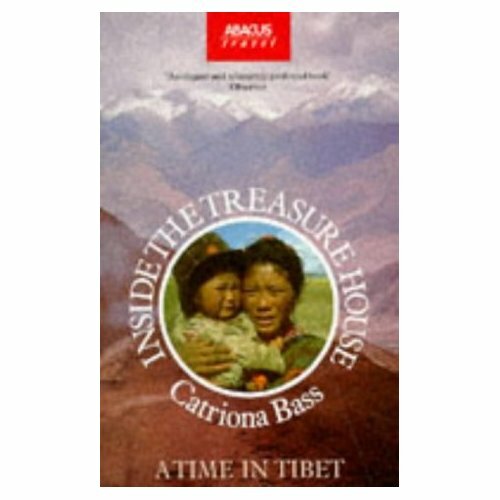 Catriona Bass in her book ‘Inside the Treasure House’ recounts her memories of the festival in Lhasa: Full moon brought Monlam to a close with the Butter Festival – “The Offerings of the Fifteenth Day”. The making of sculptured butter offerings originally comes from Bon, Tibet’s pre-Buddhist animist religion, but the festival probably dates from the time of the Great Fifth Dalai Lama. During the cultural revolution China abolished Monlam. However, in India and Nepal the followers of Tibetan Buddhism celebrate this festival with utmost devotion. 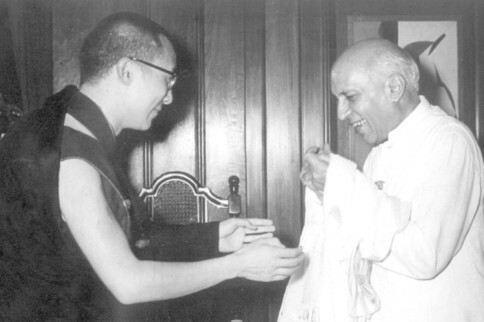 In India, under the mentorship of the Karmapa, Monlam is celebrated every year. 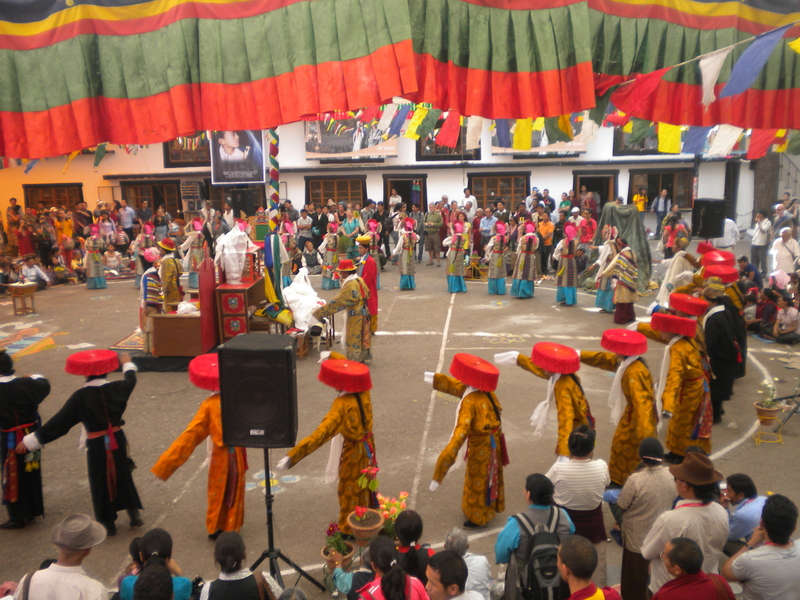 Shoton – the Yogurt Festival: Also known as the Yogurt Banquet Festival, it is one of the most important festivals of the Tibetans celebrated to mark the end of the annual summer meditation retreat of the Buddhist monks. It Tibet, it was celebrated right at the end of summer when the grass was lush and the animals would produce milk. Since yogurt was produced in abandon during that season in Tibet, the participants would offer yogurt to the retreating monks. This festival too originated in the 15th century at Drepung Monastery near Lhasa. Later it would be celebrated in Potala Palace (residence of the Dalai Lama in Lhasa), Norbulingka (Dalai Lama’s summer palace in Lhasa) where Lhamo troupes would come from all over Tibet to perform. The Tibetan community in exile in India celebrates this festival in spring. In Dharamsala six troupes from various places in India perform traditional Tibetan opera during this festival; though yogurt no longer plays a key role. I guess the Tibetans had to submit to the topography and environment of India. Coming Back to Majnu Ka Tilla: One of course sees the changing face of the Tibetan community in India which has blended traditional customs with modern day living. My visit to Majnu Ka Tilla is replete with vignettes of graceful Tibetan women in their traditional attire selling thukpa and momos in the monastery courtyard, cacophony of little Tibetan children playing around the giant prayer wheel, the wizened old lady with her motherly smile selling dried meat, a few others selling fresh green pok choi leaves – all I do at times is sit on a bench in front of that monastery and spend hours marveling at the beauty of this rich culture. 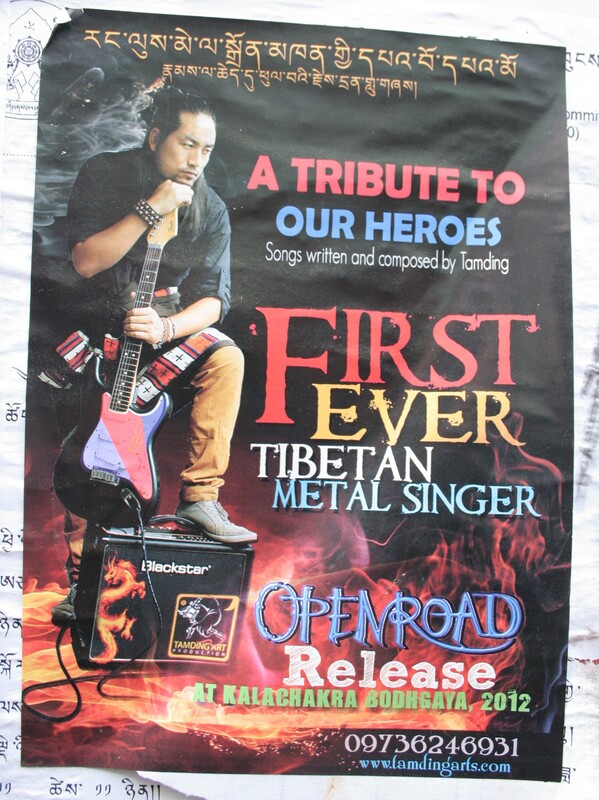 As I go towards my favourite eateries through the narrow lanes, I see a poster promoting the first ever Tibetan Metal singer. I also see octogenarians who probably have now given up hope of ever visiting the motherland they had to leave as a young boy or girl, again. I also bump onto a young Tibetan lad who works for a popular News Channel, filling in for his brother in a cool cafeteria that he runs. I see monks wearing their snickers and craftsmen busy carving out prayer lamps. Sometime one wonders where this Tibetan issue will converge. Then I am reminded of one thing. We are a blessed land – a land despite its own woes and strife has had the honour to support over 1.5 lakh Tibetans for more than 50 years. Blessed is this nation which has His Holiness making India his temporary abode and blessing the land with his spiritual aura. Tibetans have added a beautiful element into the culture of India. Most importantly, it has given young India its new found favourite snack – THE MOMO.